A new season brings new allergies. When searching the shelves for a solution, don’t forget about exercise! A workout is an invigorating way to clear your head, physically and mentally. It can bring temporary relief to sinus pressure and congestion. Increased circulation, particularly from an aerobic routine, helps alleviate pressure and ease breathing. Increased heart rate and core body temperature also loosens sinus congestion. Your cardio session acts as a decongestant. Workout with tissues, and expect a clearer head. Physical activity of any kind is helpful, evidenced by how a stuffed nose and sinus headache are worse when lying down. When upright, gravity assists with activity to drain sinus cavities blocked by mucus. Consider the flowing movements of yoga to help clear congestion. Some poses are especially helpful for this. See fitnessandwellnessnews.com/work-out-sinus-pressure for illustrated guidance. Mindfulness enhances this workout to help experience physical and mental clarity. Those with asthma may be reluctant to exercise for fear of exacerbating symptoms. Some asthma can be triggered by exercise alone or in unison with allergies. In actuality, regular exercise strengthens and conditions the lungs to make their work easier. Exercise also relieves stress and improves mental health, which can help alleviate chronic suffering. Keep workouts short, especially during susceptible times or when beginning a new routine. Gradually increase your sessions to avoid sudden strain on your lung capacity. Speak with your physician to determine if use of an inhaler is necessary before or during exercise. You may benefit from daily maintenance medication, as well. Try to keep formal workouts indoors. This prevents environmental triggers for asthma and allergies, such as pollution, pollen, and weather. Perform an appropriate warm-up. This allows your body, including the respiratory system, smooth transitions. Fifteen minutes is recommended so lungs have ample time to adjust to the increased oxygen demand. And, don’t forget a proper cool-down of the same duration. Avoid exercise if you have a virus, especially one that involves congestion or a cough. Alert your personal trainer and fitness instructors about your condition. Inform any workout buddies, as well. Support may be helpful in the event of an attack. Effective asthma treatment allows one to maintain an active, healthy lifestyle. With a physician-approved action plan, you can control symptoms and enjoy exercise. A combination of medication, monitoring symptoms and lung function, and identifying triggers can help determine your best exercise program. If your allergies are increasing in intensity right now, you are likely reacting to ragweed, the most common fall allergen. Ragweed pollen is predominant in August and September and can linger until mid-November in some locations. Autumn’s wet, windy weather can also increase the presence of mold spores, causing misery to those with mold or fungi allergies. Visit an allergist to determine your specific allergens and treatments. Talk with your physician about how a fit body can help maintain a physically (and mentally) clearer head. Year-round, the Center offers a clean, air-filtered environment for your workouts. 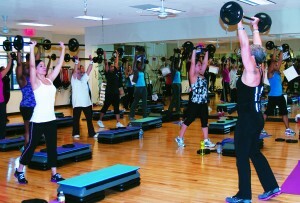 On-site fitness and health professionals help assure you only get winded from a healthy sweat session.